R... Rajkumar, ealier known as Rambo Rajkumar is an upcoming Hindi action film directed by Prabhu Deva and written by Shiraz Ahmed. Film's producer is Viki Rajani and by Eros International. 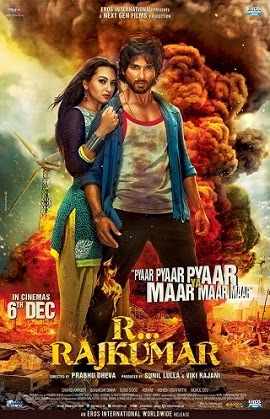 The main stars are Shahid Kapoor and Sonakshi Sinha. Prabhu Deva was always very keen to work with music composer Pritam. Now, he has finally managed to get him on board.The film is set to be released on December 6, 2013. According to reports, the makers of the original Rambo series have copyrighted the word Rambo making it unavailable for usage by other filmmakers. As a result the makers have now decided on a title change for the film. However, since the film's title is already known among the audience the makers have decided on dropping a few alphabets from the title rechristening it to 'R... Rajkumar'. The official trailer released on 1st October 2013.